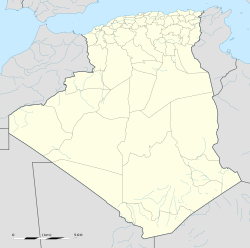 Boufarik is a town in Blida Province, Algeria, approximately 30 km from Algiers. In 1998, its population was 48,800. The major neighbourhoods of the city are: K'ssar, Blatan, Ben gladash, Mimoun, Trig erange, Bariyan. The city is well known for the production of oranges. The main stadium is the Boufarik Stadium (Stade du Boufarik). Jean-Claude Beton, founder of Orangina. This article about a location in Blida Province is a stub. You can help Wikipedia by expanding it. This page was last edited on 30 September 2018, at 20:55 (UTC).